We are so happy to be able to share these details of the new Intellivision console. Please help us spread the word by sharing our reveal trailer and information on social media. Thank you for your support and we look forward to giving you more updates soon! 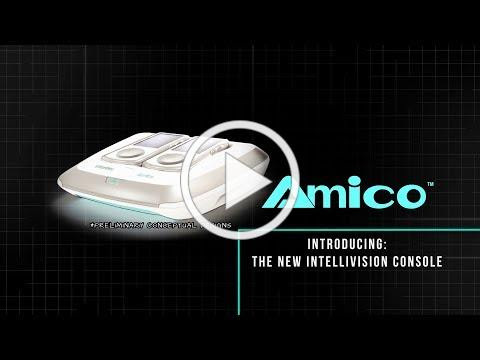 IRVINE, CA, October 22, 2018 – Almost 40 years after the release of the original Intellivision®home video game system which helped to redefine the video game industry, Intellivision Entertainment is proud to carry on its “Legacy of Firsts” by announcing the brand new revolutionary family home video game console named Amico™ to be released on October 10th, 2020 (1010 2020). Amico is the Italian word for “friend” or “buddy” and encapsulates an element of the approach and dynamics for what makes the new console so unique and an exciting addition to everyone’s family. Intellivision Entertainment continues to build upon its gaming legacy with support and expertise from industry veterans and superstars, including longtime product manager/producer/marketer Jason Enos (involved in over 100 products launches, including the Metal Gear Solid®, Castlevania®, Contra®, Dance Dance Revolution®, Silent Hill®, TEKKEN™, Ace Combat®, Dragon Ball Z®, Monopoly® and PAC-MAN™franchises), Perrin Kaplan (Zebra Partners, former Nintendo VP of Marketing & Corporate Affairs; launched the Nintendo Wii®, Nintendo DS®, Super Nintendo®, Nintendo Gamecube®, N64®), Beth Llewlyn (Zebra Partners, former Nintendo PR; launched the Nintendo Wii®, Nintendo DS®, Pokemon™), Scott Tsumura (Tozai Games, formerly co-founder and President of Nintendo Software Technology Corporation, and a pioneer in the early days of arcade game production, including Moon Patrol, Kung Fu Master, 10 Yard Fight, etc. ), Phil Adam (Founder of Spectrum Holobyte, President & VP of Interplay Productions, helped introduce Tetris® to the world), André LaMothe (Hardware Evangelist, programmer, designer, author, over 750 products to market, artificial intelligence design for NASA) and advisor David Perry (Earthworm Jim™, Disney’s Aladdin™, founder of Shiny Entertainment and co-founder of Gaikai cloud gaming utilized in the Sony PlayStation®4). The Intellivision control disc was the first game console to offer a directional thumb pad which was the predecessor to what later became the industry standard directional pad (D-Pad). It was also the first game console to allow for 16 directions while offering 4 action buttons and a 12-button keypad, which opened up greater game play options and control. The Intellivision was the first video game console that had a built-in PAUSE feature on the controller. The first console to have built-in screen burn-in protection by blacking out the TV after a few minutes of game inactivity. This vision and idea was the precursor to the entire “screen saver” concept. With the release of the Keyboard Component, Intellivision was one of the first video game systems that was able to be used and turned into a home computer. The Intellivision Music Synthesizer was the first game console or home computer to offer a musical synthesizer keyboard. This allowed people to play and create music using technology. The first home console and video games to use a tile based playfield which allowed for the display of detailed graphics and color with very little RAM. Intellivision was the first game console to have a complete built-in character font. Intellivision’s system font had complete upper and lowercase alphabets, numerals, and almost all of the punctuation and symbols found on standard computer keyboards. The Intellivision game Utopia™ was the very first “real time strategy” and city building/god game.